The FT are calling the tea dress the "frock of the moment". 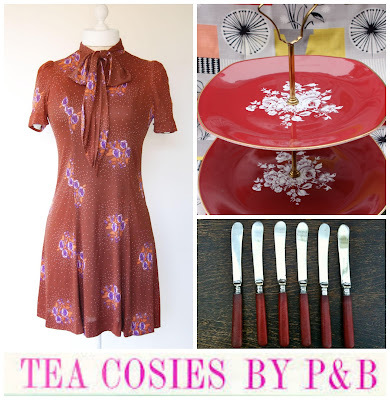 And who am I to argue (except to say, actually, the tea dress is a long-term love of mine)? 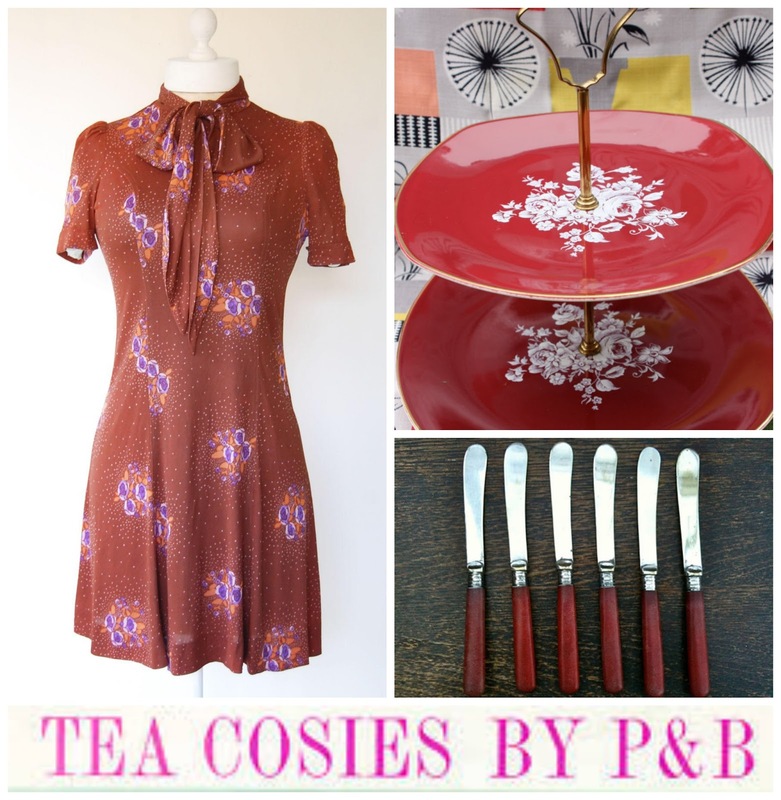 In honour of this proclamation, this month's vintage column is dedicated both to the tea dress and to hosting a vintage-style afternoon tea. Think tea dress, and chances are you're thinking of a 1940s number, with a fitted bodice and loose skirt. But the term is used to cover a whole variety of eras and dress shapes. The tea gown came into being in the 19th century when taking afternoon tea also became a thing. These gowns were often lavish creations worn in a bid to be the hostess with the mostest. Perhaps more significantly they were worn without corsets - space to expand is very important if the taking of tea is involved! I've managed to track down a few affordable 40s originals, such as the dress pictured in the image above - a 40s stretch silk jersey dress, available from Lady Pearls Vintage for an extremely reasonable £45. 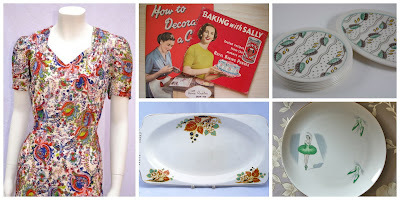 However, the perennial popularity of the style means you can get a similar look from many different decades of vintage: just take a look at these gorgeous examples I've found from the 1950s, 60s, 70s (my personal favourite) and 90s. 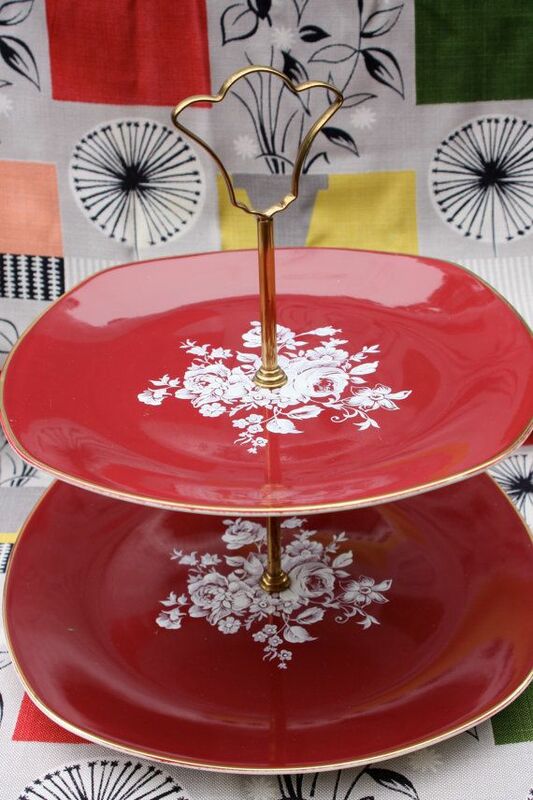 Of course, the other appealing thing is all the fabulous accoutrements that accompany the ritual of taking tea: as well as the tea cups, saucers and plates (more of those later), there are all sorts of amazing accessories to buy, like cake stands - this beautiful red number is £25 from Aspidistra Vintage - tea knives, milk jugs and dedicated sandwich plates. It's a vintage rummager's treasure trove. It probably goes without saying there are plenty of reproduction 1940s dresses available too, usually made in sizes suitable for us twenty-first century women and our washing machines. 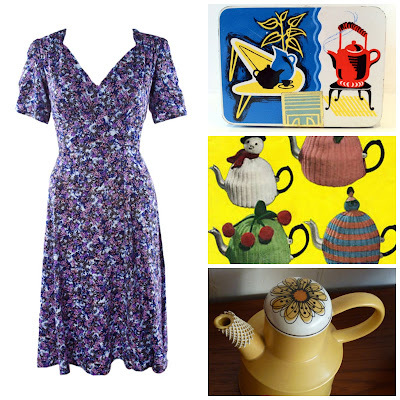 The dress pictured is from 20th Century Foxy and is currently reduced to £60. I like their red gingham design too, as well as Revival Retro's flora dress. And, if you don't want to be so strictly retro, there are lots of contemporary interpretations of the look on the high street at the moment at everywhere from Boden to Orla Kiely (for channelling your inner Carole Middleton). 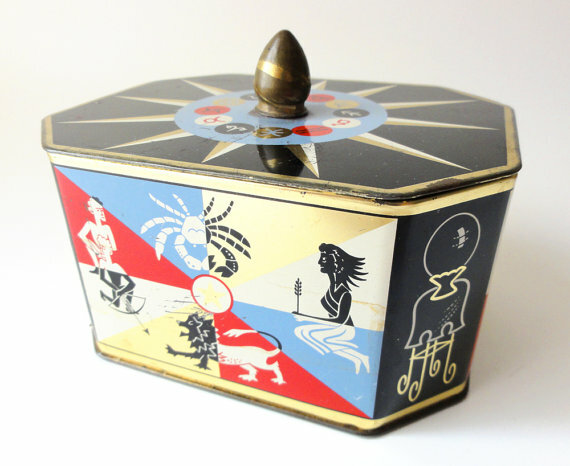 I am going to be accessorising my dress with a tea caddy. There are some brilliant designs out there, and I'm planning on booting out the tea in favour of using them to store some of my make-up. Mid-century fans should take a look at this 1960s Twinings caddy, while the 1950s zodiac tea caddy pictured above is surely as glamorous as tea time gets. 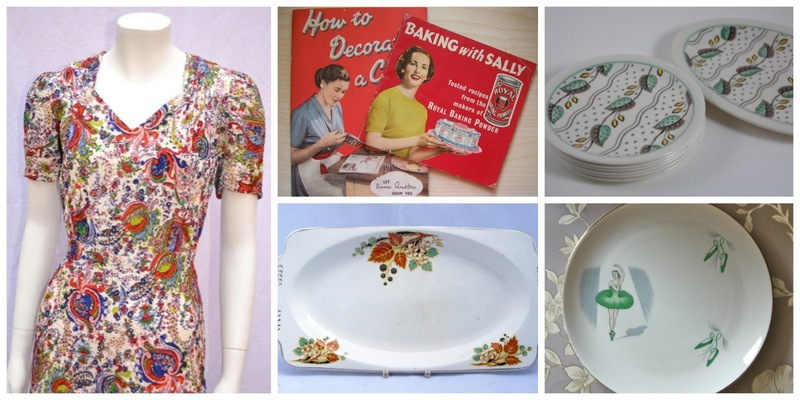 It's available for only £16 from Salisbury-based Chixy Coco vintage. Here's my final tea dress of the day, and possibly my favourite: an original 1940s number with a gorgeous Paisley pattern (although this 40s lace number would be a late contender if I could find a suitable slip for it). The pattern also reminds me of one of the best things - aside from the food and the drink - about tea taking, which is the pretty crockery. 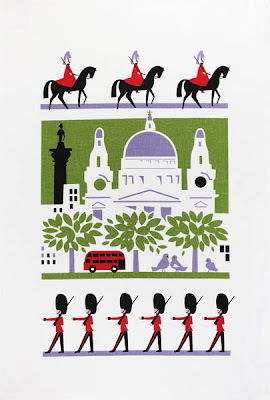 You can pick up such lovely designs featuring flora, geometrics and even the ballet for not very much money at all. Or there's plenty of designs in mouth-watering pastel shades too, such as these cups and saucers from The OK Corral, or these plates from Toast and Marmalade. The challenge is trying to get all these different styles and patterns to work together without your table top looking like a charity shop. Here's where I recommend consulting some of Britain's finest hostesses. I find Angel Adoree's Vintage Tea Party book ("The Most Beautiful Book Ever?" - Kat Brown, 2011) particularly inspiring, or Betty Blythe's Style Me Vintage Tea Parties gives advice on creating events based around different decades. Her west London tea room also hosts marvellous 1920s tea parties. For a more energetic kind of tea, the Waldorf Hilton offers high tea and dancing in their Palm Court for £49 a head. Sadly it's time to round up our merry gathering. What way to finish these tea time delights other than with the usual - the washing up. Even that can be done in vintage style thanks to the Daphne Padden range at To Dry For which uses original 1950s and 60s designs. 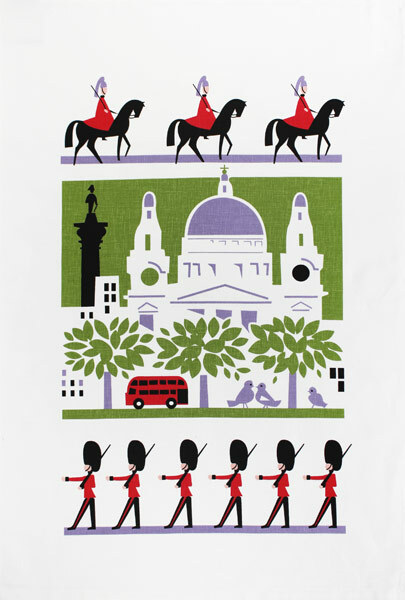 I'm in love with this Scenic London tea towel which sells for £11.95. And now surely it's time to put my feet up and think about my next cup of tea?